Preterm infants are at greater risk for neurodevelopmental disabilities than full term infants. Interventions supporting parents to improve the quality of the infant’s environment should improve developmental outcomes for preterm infants. Many interventions that involve parents do not measure parental change, nor is it clear which intervention components are associated with improved parental outcomes. The aim of this review was to categorize the key components of early intervention programs and determine the direct effects of components on parents, as well as their preterm infants. MEDLINE, EMBASE, CINAHL, ERIC, and Cochrane Database of Systematic Reviews were searched between 1990 and December 2011. Eligible randomized controlled trials (RCTs) included an early intervention for preterm infants, involved parents, and had a community component. Of 2465 titles and abstracts identified, 254 full text articles were screened, and 18 met inclusion criteria. Eleven of these studies reported maternal outcomes of stress, anxiety, depressive symptoms, self-efficacy, and sensitivity/responsiveness in interactions with the infant. Meta-analyses using a random effects model were conducted with these 11 studies. Interventions employed multiple components categorized as (a) psychosocial support, (b) parent education, and/or (c) therapeutic developmental interventions targeting the infant. All interventions used some form of parenting education. The reporting quality of most trials was adequate, and the risk of bias was low based on the Cochrane Collaboration tool. Meta-analyses demonstrated limited effects of interventions on maternal stress (Z = 0.40, p = 0.69) and sensitivity/responsiveness (Z = 1.84, p = 0.07). There were positive pooled effects of interventions on maternal anxiety (Z = 2.54, p = 0.01), depressive symptoms (Z = 4.04, p <.0001), and self-efficacy (Z = 2.05, p = 0.04). Positive and clinically meaningful effects of early interventions were seen in some psychosocial aspects of mothers of preterm infants. This review was limited by the heterogeneity of outcome measures and inadequate reporting of statistics. Interventions for preterm infants and their mothers should consider including psychosocial support for mothers. If the intervention involves mothers, outcomes for both mothers and preterm infants should be measured to better understand the mechanisms for change. Preterm birth (before 37 complete weeks of gestation) is challenging for both the infant and the family. The long-term morbidity of these infants is a serious public health concern . Organ systems are insufficiently developed to fully support extra-uterine life resulting in increased biological risk for complications of prematurity [2, 3]. Compared to children born at term, preterm infants are at greater risk for neurodevelopmental disabilities including cerebral palsy , mental retardation [4, 5], vision impairments [6, 7], and hearing loss [4, 8]. As preterm infants develop, there is an increased risk of cognitive and language delays [7, 9, 10], hyperkinetic disorders [4, 11], behavioral and emotional problems [3, 4], and learning disabilities [12–14]. These risks increase as gestational age at birth decreases [15–17]. The medical and educational services, and lost productivity associated with preterm infants cost more than $26.2 billion USD in 2005, or $51,600 per infant , and far exceed the costs for term infants [19, 20]. Families caring for preterm infants experience increased stress [21–23], anxiety , and depression [21, 24]. Together, these psychosocial factors influence maternal sensitivity and responsiveness in interactions with the infant , which ultimately affect child developmental outcomes . Early interventions often target the child’s environment , which includes parents and assumes that a positive environment will subsequently improve child outcomes. The risk for developmental disorders varies by gestational age. Thus, the majority of interventions for preterm infants that involve parents are complex and include multiple components. While it is critical to understand how the intervention works , most evaluations do not explain how the key components exert their effect on parent or child outcomes. The aim of this review was to categorize the key components of early intervention programs for preterm infants and their parents, and determine their effects on parental stress, anxiety, depressive symptoms, self-efficacy, and sensitivity/responsiveness in interactions with the infant, and subsequently, on child development. For the purpose of this review, ‘early intervention’ refers to prevention-focused programs occurring soon after birth when the infant’s brain is plastic [29, 30] and interventions are more likely to have maximal impact . If efficacious early interventions are necessary to optimize outcomes for preterm infants, then clear evidence of the key components that contribute to these outcomes is required to refine complex interventions and target them to the preterm infants and families who will benefit most. Theory guides the link between intervention components and outcomes. Psychosocial support of parents to decrease stress, anxiety, and depressive symptoms, and increase self-efficacy and maternal sensitivity and responsiveness in interactions with their infants should have a positive effect on the child’s environment , and subsequently improve the preterm child’s developmental outcomes. Educational intervention may increase parental knowledge and skill in caring for preterm infants and subsequently increase parenting self-efficacy and decrease stress. Education may include (a) information about infant growth and development, (b) demonstrations of infant behaviour with discussion, or (c) active involvement of the parent in interaction with the infant with feedback from a professional. Developmental intervention delivered by the parent may also have an effect on the child’s development. Thus, three main categories of intervention components may affect outcomes: psychosocial support for the parent, parenting education, and therapeutic developmental support for the child. What remains unclear in the literature is whether or not the intervention components have an effect on parents as the mechanism to improve outcomes for preterm infants. If so, it is unclear which components in complex interventions have the greatest effect on parents and development of preterm infants. Why is it important to do this review? No other systematic review has examined the specific components of interventions with an effort to untangle the mechanisms underlying the effects on parent outcomes, and subsequently child outcomes. McCarton and colleagues  did a narrative review of a “representative sampling” (p. 331) of 19 programs dating back to 1971. They found only modest benefits for children with low birth weight (LBW). Infant-focused physiotherapy programs had little effect on motor or cognitive outcomes. Parent-focused programs improved the quality of parent-child interactions with inconsistent effects on cognitive development. Interventions with parent and child components had positive effects on parent-child interactions and child development. The authors concluded that interventions for preterm infants with parent support and education may provide a more optimal environment for child development. While McCarton and colleagues address parent outcomes, their review was not comprehensive, did not consider the quality of the studies, and requires updating. The most recent systematic reviews and meta-analyses focused only on cognitive and motor outcomes of preterm infants [32–34]. In their Cochrane review of randomized controlled trials (RCTs) or quasi-RCTs of preventive early intervention programs for preterm infants up to 2009, Spittle et al. and Orton et al. found positive effects on preschool cognitive development that were not sustained at school age. There were no effects on motor development at any age. Vanderveen and colleagues  assessed RCTs or quasi-RCTs published up to 2008 of early interventions for preterm infants and parents. Intervention components were diverse and included education for parents, infant stimulation, home visitation, and developmental care in the neonatal intensive care unit (NICU). Meta-analyses of cognitive and motor development at 12 months showed significant improvements favouring the intervention groups. At 24 months, positive effects remained for cognitive scores only. By ages 3 and 5 years, no significant effects remained. A unique contribution of Vanderveen and colleagues’ review was the focus on parental involvement in care and recognition of diverse intervention components. While it is important to understand the effects on preterm infants, none of these reviews included outcomes for the parents who were targeted as the medium for delivery of the intervention. Pridham and colleagues  conducted an integrative review of 22 nurse-led quantitative intervention studies designed to promote parent-child interactions and relationships. Preterm infants were not the specific focus, but some were included. These authors called for an increased emphasis on theoretical underpinnings of interventions with specific attention to factors that lead to child and parent outcomes. Ethnicity and parent gender (mothers and fathers) may influence interactions with young infants yet these variables are rarely studied. This knowledge gap was noted in a qualitative synthesis of parental perspectives on parent-child relationships by the same group  that included some studies of parents with preterm infants. Thus, important gaps in previous literature reviews exist, which need to be addressed. The objectives of this systematic review of early interventions for preterm infants were to: (a) identify key parent outcomes, (b) determine the quality of evidence for the RCTs, (c) estimate the intervention effects on parent outcomes, (d) categorize the key intervention components associated with maternal outcomes and subsequently child outcomes, and (e) apply the results to clinical practice and future research in order to assist delivery of focused, cost-effective, preventive developmental interventions for preterm infants and their families. Studies published between 1990 and 2011 were included if they met the following criteria: (a) published in English, (b) RCT, (c) children born preterm (gestational age less than 37 weeks), (d) primary RCT of a preventive intervention started before the child was age 3 years (corrected age); (e) intervention involved parents (mother and/or father), and (f) intervention included at least one session in the community (home or clinic). The critical importance of proximal environments for early child development led to our focus on interventions with at least partial home or community components. Multiple reports of the same sample were treated as a single study. Articles that reported a pilot RCT (i.e., Melnyk et al. ) and a full RCT (i.e., Melnyk et al. ) with different samples were treated as separate studies. Articles excluded from the review were (a) non-RCT designs, (b) review articles, (c) interventions occurred in hospital only, (d) focused on a subset of preterm infants such as those already diagnosed with a developmental problem such as a behavioural disorder, or (e) targeted nursing staff. Drop outs were defined as non-completion of the intervention. Outcomes were defined as assessments prior to intervention and conducted again close to the end of the intervention. Follow-ups were assessments at any time point after the outcome assessment at completion of the intervention. A health sciences librarian (KAH) and investigators (KB and JME) developed the search strategy. Keywords and MeSH terms/subject headings were reviewed. Pretesting the search strategy and preliminary searches ensured that all appropriate keywords and subject headings were incorporated into the final search strategy. In order to focus on interventions including parents, MeSH/subject headings were used for the concept “parents” in every database searched. This strategy did result in one important study being missed initially , and was identified during hand searching of reference lists. The OVID MEDLINE final search strategy is reported in a supplementary Table. Literature from 1990 to December 2011 was searched using the OVID interface for MEDLINE, EMBASE, and Cochrane Database of Systematic Reviews. CINAHL and ERIC were searched via the EbscoHost interface. The search strategy was saved for each database so it could be re-run to update the search. The year 1990 was selected to align with the implementation of developmental care  and increased parental involvement in the care of preterm infants. The reference lists of each included article were hand searched. Most of the references were additional reports of the RCTs that had already been identified or additional follow-up studies. Some references pre-dated 1990. Tables of Contents were not searched because of the magnitude of a search of multiple journals from diverse disciplines over the established timeline. The Web of Science was used to determine ‘cited bys’. No additional articles were identified. Searches were exported to separate folders in the bibliographic management program RefWorks  and later merged into a single folder. Duplicates were deleted. Data were entered into RevMan 5.1  for analyses. Methodological quality was assessed by MB and KB using the Cochrane Collaboration’s Tool for assessing risk of bias . After discussion, there was complete agreement between MB and KB on the risk of bias scores. See supplementary table, additional file 1 . Publication bias was assessed using funnel plots with standard error as the vertical axis and standard mean difference for intervention effects on the horizontal axis . In studies that included parental outcome scores, standardized scales were used. The principal summary measures were means and standard deviations. Standardized mean differences were calculated because there were multiple outcome measures with different standard deviations. Pooled effects for treatment were calculated using a random effects model because of large heterogeneity (i.e., I2) across studies overall. Although the term parent was used in the majority of studies, the unit of analysis was the mother. Therefore, only information related to mothers is reported. Effect sizes were included for continuous level outcomes from the measures of stress, anxiety, depressive symptoms, self-efficacy, and sensitivity/responsiveness. No corrections were made to account for studies with small samples. The value for the test of significance for overall effect was set at p < .05. Heterogeneity was assessed using I2 statistic. Studies in the review varied in terms of sample size, number and type of intervention components, delivery format, and outcome measures. A meta-analysis was conducted when an outcome was reported in two or more studies. No subgroup analysis was planned or conducted. 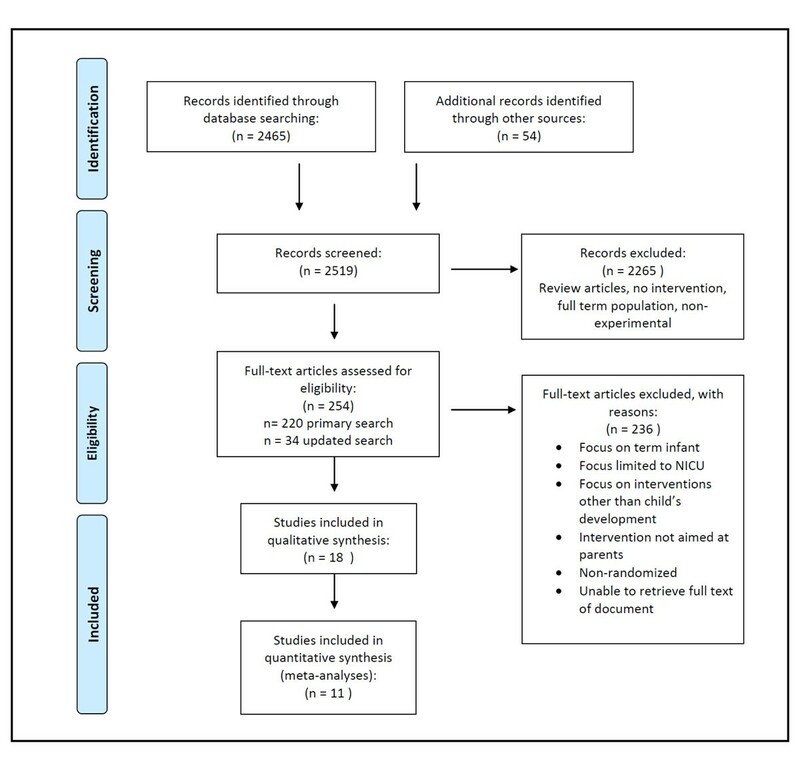 The primary literature search yielded 2465 titles and abstracts, of which 220 were identified by KB and KAH as potentially relevant for full text review. Inter-rater agreement was 99% between KB and KAH on the first 100 titles and abstracts from Medline extracted to August 10, 2010. Disagreements were resolved by consensus. Upon critical review of the full text, only 19 articles met the inclusion criteria. Upon detailed review, the study by Sajaniemi et al. was excluded because it was a case control study. Bagner et al. was excluded because the intervention targeted older (range 18 to 60 months) preterm children with a diagnosed behavioural disorder. The search was updated on December 31, 2011 and yielded 34 additional titles and abstracts. From these, one additional RCT  was added. Thus, 18 studies were included in this review. See Figure 1 for the study selection flow diagram. The included studies were conducted over the last 21 years; 45% of studies were published in the last 5 years. Studies were from Australia [49, 50]; England [51, 52]; Germany ; Italy ; Japan ; Netherlands ; Norway ; and the United States [38, 40, 57–61]. See Table 1 for characteristics and methods of studies included in the review. One study reported a cluster RCT . All studies included preterm infants in an intervention group (e.g., kangaroo care ) that was compared to a control (e.g., standard care) or comparison group (e.g., traditional holding ). A few studies included a term reference group. Preterm infants were matched on demographic variables to a term reference population born near the same time , while Kaaresen et al. included a non-matched term reference group. Follow- up studies were published for six RCTs [23, 40, 50–52, 62], and follow-up ranged from 6 months  to 18 years  after birth. Characteristics and methods of studies included in review (by date). Note: *Study methodological quality was assessed by Cochrane Collaboration’s Tool . All studies involved interventions that included mothers, yet seven of the 18 studies measured only child outcomes [40, 51, 53, 54, 58, 60, 64]. While these studies make important contributions to understanding the effects of interventions on preterm infants, they do not contribute directly to an understanding of the differential effects on parents (i.e., mothers and fathers). Five studies included fathers in their interventions [23, 39, 50, 53, 62], but only Kaaresen et al. and Melnyk et al. reported outcomes for them. In one study, only one father participated , and in another , data for fathers were not collected. Koldewijn et al. described the proportion of fathers who participated in the intervention. Outcomes for mothers were reported only in their follow up studies [56, 65, 66]. The infants were described as preterm (< 37 weeks gestation) and/or low birth weight (< 2500 g). Saylor and colleagues  targeted preterm infants with an intra-ventricular hemorrhage and also randomized preterm infants to early versus late start of the intervention. Inclusion of singleton versus multiple births varied across studies. Four studies [38, 39, 54, 55] included only singleton births. Five studies [40, 57, 58, 60, 61] included mother-infant pairs or dyads without mention of multiple gestations. In studies that reported allocation of multiple gestations [23, 53], infants from one family were assigned to the same group. Three studies that included multiple gestations [23, 48, 51] did not report how they managed twins and triplets in their analyses. Koldewijn et al. reported that one child per family was selected for analyses; Brisch et al. reported data from the first born twin; and Newnham et al. and Milgrom  calculated sibling averages. Only Glazebrook et al. and Spittle et al. adequately controlled for multiple gestations by clustering. The sample sizes varied from 23  to 985 . Recruitment was problematic for three studies [50, 55, 58] with two studies [50, 55] terminated without achieving the planned sample size. One program targeted an ethnically homogeneous population (i.e., African American; Teti, ); however, the majority of studies did not report ethnicity. The methods to generate the randomization sequence and prevent subversion were adequately described and there was a low risk of bias related to random sequence generation in 70% of the trials. Only four studies [23, 51, 64, 67] adequately described the concealment of treatment allocation. By their nature, most were single blind studies with outcome assessors only blind to study group. Only Melnyk et al. [38, 39] concealed group allocation by distributing information in identical envelopes. Several studies had high refusal rates that ranged from 45.2%  to approximately 60% [53, 58]. Attrition was high in two studies, with losses of 23.6%  and 24% . Overall, the reporting quality of the studies was adequate. The strongest studies according to the quality rating scale (Cochrane Collaboration’s Tool ) are indicated in Table 1[23, 48, 50, 51, 61, 67]. Visual inspection of funnel plots suggested effect sizes for the studies reporting outcomes for stress, anxiety, depressive symptoms, self-efficacy, and sensitivity/responsiveness were scattered symmetrically around a central effect. These analyses were limited by the small number of heterogeneous studies with diverse outcome measures. Thus, the results of the assessment of publication bias should be treated with caution. While most studies provided some description of the intervention components, few reported sufficient detail to enable replication. Except for Gianni et al. , most delivered an intervention with a curriculum or activities defined in a user’s manual. Only studies by Melnyk et al. [38, 39] included details about timing and number of sessions, and program staff education and training. The interventions reviewed had multiple and diverse components, and a coding system was needed to group interventions. Egeland et al. coded four types of intervention approaches that promote positive change in interactions. These approaches (a) promoted parental awareness of the child, interpretation of child behaviours, and responsiveness to the child, (b) provided support to the parent including advice, anticipatory guidance, and/or emotional support, (c) increased parental awareness of their influence on their child, or (d) promoted parental well-being through decreased stress. Bakersmans-Kranenburg et al. , in their meta-analysis, integrated parental well-being into the first three of Egeland and colleagues’  categories. Based on a bio-ecological framework, we coded intervention components into three broad categories: (a) parent support (i.e., psychological counseling and social support), (b) parent education (i.e., information, demonstration and discussion, and active engagement with feedback from a professional), and (c) therapeutic child development support. KB and MB assessed the components reported in each study. After discussion, there was complete agreement about codes for the intervention components. See Table 2 for the intervention components and coded categories for each study. Some aspect of parenting education was integral to all interventions. One study provided all three intervention components . Eight studies provided parent support and parenting education [23, 48–51, 53, 54, 64], while two interventions combined parenting education with therapeutic child development support [60, 62]. The remaining seven interventions [38, 39, 52, 55, 57, 58, 61] provided parenting education only. Coding categories for parent education components: 1 = Information given: Included information that is generic (e.g., written, audiotape or videotape format), individualized to the family (e.g., written or verbal), and/or included discussion with the parent; 2 = Guided observation: included parent observation or demonstration of an activity with the infant; 3 = Active involvement: included parent involvement in active practical experiences, modeling and guided self-evaluation or self-reflection learning (e.g., video feedback). Names of Intervention Programs: APIP = Avon Premature Infant Project; CAMS = Curriculum and Monitoring System; COPE = Creating Opportunities for Parent Empowerment NICU Program; IBAIP = Infant Behavioral Assessment and Intervention Program; IHDP = Infant Health and Development Program; NBAS = Neonatal Behavioral Assessment Scale, Brazelton; NSTEP-P = Nursing Systems for Effective Parenting-Preterm; MITP = Maternal Infant Transaction Program; PBIP = Parent Baby Interaction Program; PCIT = Parent Child Interaction Therapy; Premie Start = Modification of MITP; SI- NDT = Sensory Integration and Neurodevelopmental Therapy; SM=State Modulation; VIBeS Plus = Victoria Infant Brain Studies. The parenting education component was further divided into (a) information only (generic or individualized to the family, and may include discussion of information); (b) guided observation of the infant, or (c) active involvement of parent in learning about their infant and guided reflection or self-evaluation. Four studies used information only [38–40, 51]. 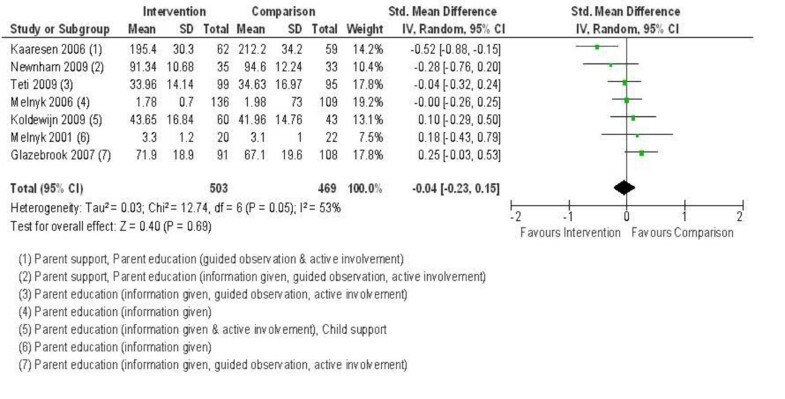 One study used only guided observation of the infant , and one used active involvement with the infant . Five studies used all three types of parenting education [49, 52, 60, 61, 64]. Three interventions combined information with guided observation [50, 55, 57], and three combined information and active involvement [48, 58, 62]. Only Kaaresen et al. combined guided observation with active involvement. Means and standard deviations were calculated from frequencies and percentages for scores reported by Ravn et al. . Saylor et al. reported correlations only and means/standard deviations could not be calculated; therefore, it was not included in the meta-analysis. Stress was measured in seven studies. Five studies [23, 49, 52, 61] reported various subscales and total scores of the Parenting Stress Index  long or short form. Koldewijn et al. did not report parenting stress in their initial report of the RCT, but did in the 12 and 24 month follow-up study . Melnyk [38, 39] measured stress using the Parental Stressor Scale: NICU . Pooled effects are reported in Figure 2. The test for overall effect of the interventions on stress was not significant. Kaaresen et al. and Newnham et al. demonstrated the greatest decrease in stress with an intervention that included parent support and education approaches (including guided observation and active involvement). There were positive child cognitive outcomes in Kaaresen et al.’s follow-up study of 5-year-olds , and positive effects on temperament for Newnham et al. at 3 and 6 months. Focusing only on parent education [38, 39, 52, 61], or parent education and child developmental support  had no effects on parental stress. Forest plot of comparison: 1 Group, outcome: 1.1 Stress. Anxiety was measured in four studies. Three studies used the State-Trait Anxiety Inventory– State score . Spittle et al. used the Hospital Anxiety and Depression scale . Pooled effects are reported in Figure 3. There was a significant reduction in anxiety across studies. Interventions with the greatest reduction in anxiety included two types of parenting education (information and guided observation; [50, 55]) with Spittle et al. including parent support. Ohgi et al. included only 24 mothers with large variability in anxiety scores. Studies with positive effects on anxiety showed positive effects on child development over the short term [38, 55] and up to 24 months . Forest plot of comparison: 1 Group, outcome: 1.3 Anxiety. Four studies measured depressive symptoms, each using a different measure. Pooled effects are reported in Figure 4. The test for overall effect was significant. It is unclear which intervention components contributed to the decrease in depressive symptoms. Melnyk et al. in their studies [38, 39] provided parent education (information only), and demonstrated similar positive effects to studies by Spittle et al. and Newnham et al. that provided more complex parent education as well as parent support. Studies with positive effects on depressive symptoms showed positive effects on child outcomes over the short term [38, 39] and up to 24 months [49, 50]. Forest plot of comparison: 1 Group, outcome: 1.2 Depressive symptoms. Two studies [55, 61] used different measures of self-efficacy. Pooled effects are reported in Figure 5. The overall effect was significant. The interventions used two or three types of parenting education. Both studies resulted in improved child outcomes over the short term only. Only Teti et al. demonstrated positive child cognitive outcomes at 4 months. Forest plot of comparison: 1 Group, outcome: 1.4 Self-Efficacy. The meta-analysis included six studies that measured sensitivity/responsiveness. Three studies used various subscales and total scores of the Nursing Child Assessment Satellite Training teaching and/or feeding scales . Others  used qualitative ratings from a sensitivity/responsiveness subscale . Pooled effects are reported in Figure 6. The test for overall effect was not significant. Two of the studies [48, 49] that showed a positive effect on maternal sensitivity/responsiveness included parenting education with active involvement and parent support. Interventions that provided information only [38, 39] were less effective. The Glazebrook et al. program  was not effective although they used all three types of parenting education in their intervention. Studies that did not show an effect of the intervention on maternal sensitivity/responsiveness showed mixed effects on child outcomes [38, 52]. Studies that showed a positive effect on maternal sensitivity/responsiveness were associated with positive infant mood at 12 months  and positive temperament . In assessments of sensitivity/responsiveness, it is difficult to untangle the effects of the parent and child contributions to interactions. Forest plot of comparison: 1 Group, outcome: 1.5 Sensitivity/Responsiveness. As a result of early interventions for mothers of preterm infants, positive and clinically meaningful effects were seen for anxiety, depressive symptoms, and self-efficacy. To our knowledge, this review was the first to categorize components of early interventions and link them to maternal outcomes. These components were parent psychosocial support, parenting education, and therapeutic developmental support for the infant. Some form of parenting education was used in all interventions. Interventions that included psychosocial support resulted in better outcomes for mothers of preterm infants. There were overall positive effects of four interventions on maternal anxiety with improved child outcomes. Anxiety is an important construct to measure in mothers of preterm infants . The results suggest that it may be more consistently linked to child outcomes than is stress. Parenting education may be a key intervention component associated with decreasing anxiety although all 18 interventions provided some form of education with varying effects on other parent constructs. Only one of the studies that had an effect on anxiety included a parent support component so this component may be a less important aspect of intervention when addressing anxiety. Three interventions, two with a parent support component, had positive effects on maternal depressive symptoms. The Victoria Infant Brain Studies  and Creating Opportunities for Parent Empowerment [38, 39] were effective for depressive symptoms as well as anxiety. The Mother Infant Transaction Program [23, 48, 49, 64] also had an impact on stress. Given that depression is a common and costly problem for mothers of preterm infants [21, 24], it should be measured consistently as an outcome measure of the effectiveness of interventions. Depressive symptoms for mothers of preterm infants stem from multiple factors (e.g., high perceived stress and low social support)  and therefore multiple intervention approaches that reduce stress and increase social support are required to reduce the development of depressive symptoms. Only two studies measured self-efficacy and both found positive effects. One study  had a very small sample, and the other  included only African American mothers, limiting the quality and generalizability of the evidence. The positive effects of the interventions on self-efficacy were associated with improved infant outcomes only over the short-term. Intuitively this makes sense because the two interventions used information combined with observation of the infant or active involvement with the infant. Information may be relevant at the time it is delivered, but infants change qualitatively over time and additional information sessions may be important to achieve sustained effects on self-efficacy. Alternatively, interventions for self-efficacy may have limited effects on long term outcomes for preterm infants. The second most commonly measured construct for parent outcomes was sensitivity/responsiveness and the overall effect was not significant. This construct is difficult to capture as it depends on the child’s skills as well as the parents. Intervention can target only the parent side of interactions. For the three studies that found an increase in sensitivity/responsiveness, two of the interventions included parent support as well as parenting education. All three of the studies that showed little or no change had no parent support but several types of parenting education. Despite Pridham and colleagues’  integrative review of nursing interventions that encouraged parenting education and discussion of child behaviour, it would appear that more than just education is needed. In addition, Newnham et al. suggested that aspects of parent-child interactions with preterm infants may be more challenging at different ages, thus time at outcome measurement may be critical in measuring sensitivity/responsiveness. Location for interventions (NICU and home) may influence outcomes that target parent-child interaction resulting in inconsistent outcomes . Stress was the most commonly measured construct of all maternal psychosocial outcomes. This is not a surprise given that the literature has reported increased stress for families caring for preterm infants [21–23]. However, the meta-analysis suggests that the interventions reviewed have little effect on stress overall. It was not clear why there were limited effects on stress overall when the seven studies were considered together. The two interventions with an effect on stress [23, 49] used a parent support component combined with an active involvement type of education and also found positive child outcomes. Parenting education alone did not reduce stress. The five studies with little or no effect did not have a parent support component, which may be important for addressing stress. The Parenting Stress Index  was often used allowing comparison across studies but it may be too generic a measure of stress for mothers of preterm infants. Various subscale and total scores of the short and long forms of the measure were used making it difficult to untangle which aspects of parenting stress are of concern for mothers of preterm infants. Alternatively, it may be difficult for interventions to reduce stress by the time of outcome measurements. Kaaresen et al. measured stress three months after the completion of the intervention and reported reduced stress levels and improved long-term child outcomes. In most studies, stress was measured at completion of the intervention [38, 39, 49, 61] or within 6 weeks of the intervention . Studies that used the Parental Stressor Scale- NICU also failed to show positive effects on stress at NICU discharge, a point in time when parent stress levels are reportedly very high [21, 78]. The time point at which the stress outcome was assessed may influence the apparent effectiveness of interventions. Alternatively, interventions may have different effects on parental stress depending on severity of infant illness. Timing of measurement and subgroup analyses should be considered in future research. It is clear that no one intervention component is consistently associated with improved parent outcomes. The interventions provided were complex with multiple and varying components. Indeed, parent education was the only component used in all of the interventions and the delivery, type and dose of parenting education varied. Of the interventions that provided direct support to parents, only half measured outcomes for parents. It is encouraging that the studies that provided support found positive effects on parent outcomes that were often associated with improved child outcomes. Parent support may be an important component of interventions for preterm infants. This review is limited by several factors, such as inclusion of studies published in English only. Inclusion of studies published in other languages may alter the results of meta-analyses. Lack of socio-demographically homogeneous samples (except Teti et al. ) may have influenced the ability to demonstrate effects of the interventions on mothers and preterm infants. One study  had challenges recruiting sufficient sample and was underpowered. Positive effects may not have been identified. The measures used in the studies included in the meta-analyses varied and the results may reflect differences in the construct being measured. It was also not possible to consider the effects of dose, location of the intervention, or study quality when conducting the meta-analyses. Finally, the I2 statistic suggested significant heterogeneity among the studies in the synthesis. Even using a random effects model, heterogeneity is a limitation in this review. A problem with many studies in this review was that they reported “caregiver” (e.g., Meijssen et al, ) or “parent” and included data for mothers, only. Other studies (e.g., Spittle ) reported 98% female caregivers without indicating the relationship of the remaining 2% of caregivers to the child. If those caregivers were fathers, then they should be analyzed separately or excluded from analyses because mother-infant and father-infant interactions are different . Given the small number of fathers who participated in interventions, it is unlikely that this would have had a substantial effect on the overall results. A further limitation of this review is that the key components of the interventions can only be interpreted based upon what the authors of the trials have published. It is possible that our interpretations of the interventions may not reflect what has occurred due to lack of detail regarding intervention content in the reviewed studies. Our most important recommendation for future research is to measure the effects of intervention components addressing parents to determine whether parent outcomes change, thus altering the child’s proximal environment. One third of the studies in this review did not directly and systematically measure parent outcomes. Consistent measures of parent outcomes would enhance the ability to build the knowledge base. Another suggestion relates to fathers. Spittle et al. and Orton et al. noted the lack of evidence-based approaches to evaluate the effectiveness of interventions for fathers. There is a critical need to conduct more rigorous intervention research in the area of interventions for fathers generally, and fathers of preterm infants specifically. Other directions for future research include the content of parenting education. Given the state of science in early brain development, promoting the development of executive functioning, a developmental problem for many preterm infants , is important. In addition, the most efficient and effective manner of delivering parenting education is still unclear. Five studies [49, 52, 60, 61, 64] used all three types of parenting education with varying effects on parent outcomes. Others [38, 39, 51] used relatively minimal forms of parenting education (information only) and found effects on parent outcomes. Unmeasured co-morbidities that would affect outcomes for preterm infants should also be captured. For example, Olafsen et al. address regulatory competence which represents early aspects of communication and joint attention. Thus, regulatory competence may be important to measure as a useful precursor to language development. Finally, the use of other statistical techniques that can model moderators and mediators of the intervention effects on outcomes (e.g., structural equation modeling) may be useful. Results from this review provide the foundation for developing and testing interventions for parents of preterm infants. Thoughtful development of large, multi-site RCTs that could test multiple components of interventions including components that show promise in improving parental and child outcomes may be useful. This review is an effort to better understand the mechanisms underlying interventions for preterm infants that involve parents. Future research needs to focus on better understanding of components of intervention and their effects on child outcomes to ensure that resources can be targeted to achieve the greatest return on investment. Direct parent support is one component to consider in future research. Karen M Benzies, Joyce E Magill-Evans, K Alix Hayden and Marilyn Ballantyne contributed equally to this work. This study was funded by Alberta Innovates - Health Solutions, formerly the Alberta Heritage Foundation for Medical Research, as part of the Preterm Birth and Healthy Outcomes Team Interdisciplinary Team Grant (#200700595). All of the publication fees will be funded by the Preterm Birth and Healthy Outcomes Team Interdisciplinary Team Grant (#200700595) from Alberta Innovates - Health Solutions, formerly the Alberta Heritage Foundation for Medical Research. KB, JM, and KAH were responsible for the study conception and design. KAH designed the database search strategies. KB and KAH reviewed articles for relevance and performed critical appraisal. MB critically appraised relevant articles. KB wrote the first draft of the manuscript. KB, JM, KAH, and MB made critical revisions to the manuscript to improve intellectual content. KB and JM obtained the funding. All authors read and approved the final version.